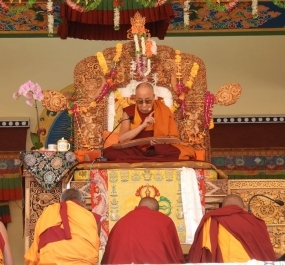 His Holiness Dalai Lama conferred Chodjug, Shantideva’s – A Guide to the Bodhisatva’s Way of Life during the two day teachings on July 30 and 31 at Jevetsal, Shey. Earlier, His Holiness also visited and imparted his teaching in Nubra, Zanskar and Kargil. Thousands of devotees flocked on the holy teaching ground and got blessed. Talking about the ‘Bodhisattva’s Way of Life’ by Shantideva written in the 8th century, His Holiness expressed the importance of learning, understanding and practical implication of the teachings. Shantideva was a monk and scholar of the Madhyamika school who taught at the great learning center at Nalanda. Bodhisattva practices are commonly known as the Six Perfections and His Holiness stressed upon the perfection of patience and meditation to overcome anger, frustration for the inner peace and happiness. Talking about the 10 chapters in the text of Guide to the Bodhisattvas way of life, His Holiness inspired the devotees to cultivate the perfections of the Bodhisattva which includes generosity, ethics, patience, zeal, meditative concentration, and wisdom. His Holiness said that the concept of the ‘Guide to Bodhisattva’ is to aspire and practices for the enlightenment for the benefit of all beings. His Holiness said that every living being strives for happiness and peace. Some thinks that living in the materialistic world is the actual happiness whereas few realizes it’s because of the mind and thoughts. The happiness and pain in our life is because of our mind. Transformation of heart and mind becomes essential to every human being for inner peace and development. The problem and suffering will be overcome if we practice and follow the path lead by Buddha instead of blindly putting faith to get solved. His Holiness also emphasised on the importance of breaking the illusion of ‘Self ‘by thinking and analyzing over it, low self esteem and laziness to achieve happiness. His Holiness asked people to be kind, generous and loving to bring inner peace and development. On the last day, lifelong empowerment was imparted.